Everyone I speak to these days is just back from or going on a wellness retreat/holiday. A friend is off to Morocco for meditation retreat, another is going to Santorini for deep cleanse and emotional release, and another to Sri Lanka for yoga and Surfing. You name it, there is a retreat to for it. Given I am in the business of organising such trips, I thought I would do some research. I was not surprised to discover wellness tourism is growing at 7.5% annually according to the Global Wellness Institute, higher than any other sector in the $3.7 trillion global wellness economy. Wellness tourism is travel associated with the pursuit of maintaining or enhancing one’s personal well-being. The emerging global middle class; rising disposable incomes; and growing consumer interest in health, travel, and new experiences are all fueling strong demand causing expenditures to grow by 6.8% annually in U.S, double the overall tourism rate. So why is this market exploding? Besides a growing consumer interest in health, travel and new experience, here is what I think based on the retreats I have organised and what my students tell me. 1. Disconnected Down Time. In this era of internet connectedness, we have never been so connected. Yet, we can also feel very disconnected from ourselves and others as a photo on our screens is not the same as having a good conversation with a friend over a meal. We’ve become addicted to the dopamine hit we receive each time we check our phones from the moment we wake up till we fall asleep. The only time we are switched off is when we sleep. On wellness retreats, access to mobile phones, tv etc is severely restricted. My clients really enjoy the break away from their phones and the quality time to have conversations with their fellow travellers. 2. Connection to Nature. Studies have shown that walking in a forest, for example, reduced stress levels by 20%. When we step onto grass, or float in the ocean or stand beneath towering trees, our heart rate lowers and our breathing slows down. Living in Dubai’s one season climate certainly leaves me longing to experience the changing seasons. Wellness retreats are usually located in serene places surrounded by natural beauty, where we can eat outside and sleep with our windows open and listen to the sounds of nature. 3. Feeding our Soul with nourishing food. When is the last time you cooked a meal? For many people eating out or take aways in front of the TV, are the norm. The food goes in with little awareness and comes out the same. Wellness retreats offer nutritious, often organic vegetarian or vegan meals, which give our digestive system a chance to rest or detox. There are even cooking classes using local ingredients so you can return and impress your friends. 4. Body Care. Wellness retreats offer a chance to practise more mindful exercises like yoga and meditation, all designed to take you into your body and out of your busy mind. By releasing tension from our body and focussing on deep breathing along with daily massages and saunas, we return feeling rejuvenated, our batteries recharged and with maybe a new friend or two. If you would like to join me on my next wellness retreat in a private villa in Goa, India, find out more here. January 28 – 3 February 2018. To share your feedback, send me an email. 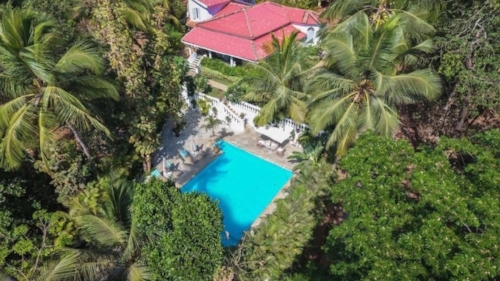 Our beautiful private villa in Goa. Massage, plant based food and daily yoga classes.